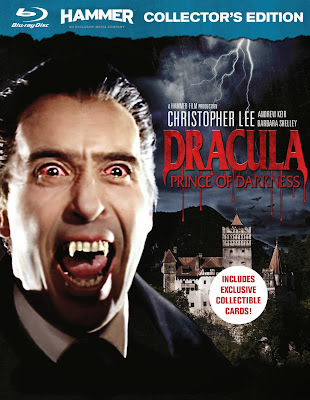 "Dracula: Prince of Darkness" (1966) is a classic Hammer horror film starring Christopher Lee, Barbara Shelley & Andrew Keir. In the late 1800s, two unsuspecting English couples are visiting the Carpathian Mountains on vacation. They are going to visit the town of Karlsbad but the local priest tries to warn them away. Since it is already on their "program" they go anyway. However the carriage driver strands them 2 km from their destination because it is getting dark and he doesn't want to be caught near the castle that he won't admit is there. A driver-less carriage soon arrives and whisks them to Count Dracula's castle where his manservant greets them and says he welcomes travelers per his dead master's instructions. Little do the tourists know that they may not be leaving the castle tonight or any night! This is a great vampire classic filled with plenty of spooky atmosphere! We have a castle with hidden dungeons filled with a resurrected vampire. Christopher Lee is brilliant as the evil and ever silent Dracula. Thanks for your comment and for checking us out!